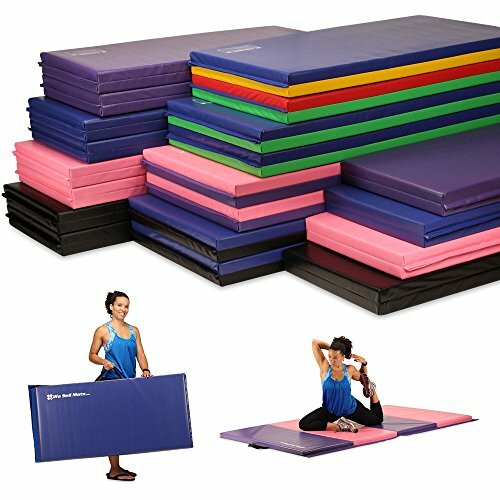 Overview: 6 feet long 2 feet wide at 2-inch thick firm high density EPE foam is ideal for activities and exercises such as yoga, aerobics, Pilates, and martial arts and many more. Surface is made of non-toxic lead-free durable 18 oz puncture resistant and non-absorbent vinyl. Moisture resistant Technology makes the mat to be easily washed with soap and water. Velcro on all sides make it easy to hook several mats together to make a large workout area or tumbling run and securing folded shape. A foldable, 4 panel design and handles on each mat make it easy to store and transport your mat. Dimensions: Expanded Dimension: 6' x 2' x 2"; Folded Dimensions: 24" x 24" x 8". 6 feet long 2 feet (Standard exercise mat size) wide at 2-inch thick firm high density EPE foam is ideal for activities and exercises such as yoga, aerobics, Pilates, and martial arts. 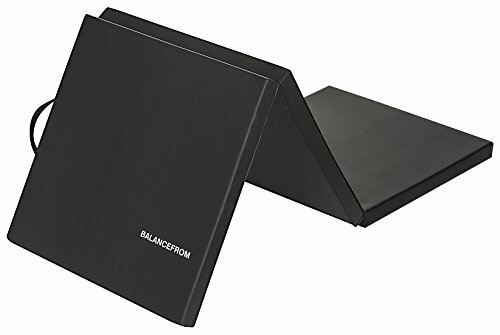 Our portable folding exercise panel mats are a great addition to any workout. Martial Arts, cheerleading, yoga, pilates, and much much more! Each mat comes in a choice of several different colors and sizes. All 2" thick, size choices are 2'x6', 4'x8' or 4'x10'. Velcro on all 4 sides make it easy to hook several mats together to make a large workout area or tumbling run. Handles on each mat make this your number one choice for a portable exercise floor. Made from safe non-toxic lead-free durable ECO 18 oz vinyl and industry standard cross-linked polyethylene foam. Our portable folding exercise panel mats are a great addition to any workout. Martial Arts, cheerleading, yoga, pilates, and much much more! Whether you're at home, the gym, or the beautiful outdoors, don't let a little hard ground stand in the way of your fitness routine. The Resource tri-fold exercise mat will help keep you fit and flexible, making various forms of training possible to do anywhere, anytime. A durable foam interior provides cushioned support and reduces pain in sensitive spots like wrists, elbows, knees, and spine. Ideal for stretching, core and strengthening workouts, Martial arts, or practicing yoga poses. 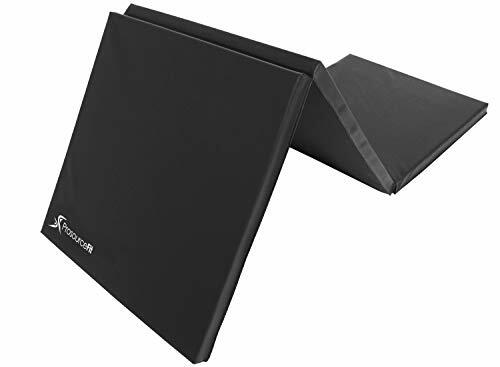 Great for gymnasts to practice their tumbling at home, and is a must-have for mobile personal trainers to use with their clients. Two carrying handles makes transportation convenient, and the tri-fold design is compact to fit easily into closets, car trunks, or in storage units at the gym. At 6-feet in length, it allows most users to lay down comfortably. It can also be used in a folded position for extra padding when you need an even softer surface. Made from EPE foam, it maintains its shape over time, and offers moderate firmness with flexibility. The vinyl covering is strong to help prevent tears with normal use, and wipes down easily for easy care and maintenance. It even comes with a limited lifetime warranty to cover any manufacturing defects so you can feel confident about your purchase. 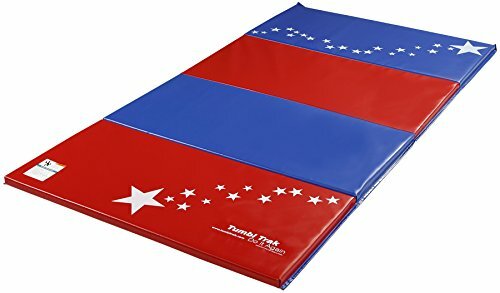 Tumbl Trak s folding panel tumbling mats are perfect for gymnastics, cheerleading, crossfit, parkour, dance, martial arts, special needs, yoga, Pilates, exercise and much more! The mats are great for use at home or at the gym. The mats are firm to help your kids practice surefooted tumbling. They are not appropriate for cushioning falls or landings. PERFECT FOR MULTIPLE ACTIVITIES. If you're a gymnast, dancer, cheerleader, martial artist, fitness enthusiast, or anybody other activity that has a need for a durable matting option; look no further than Tumbl Trak! SPACE-SAVING & PORTABLE: 9.8 x 3 .2 x0.32 ft, inflated size provides ample space for users. 15 x 11 x 9 in Folding size together with integrated carry handles allows users to stow it away conveniently without taking too much space. Cosy Life Gymnastics Training Mat isnt just for gymnasts also for fun! Surprisingly Bearing for GymnasticsMade of high quality double wall fabric, this is a 3D material which has numerous threads between the two base cloths. Once get inflated, the threads inside will stand up to hold the base fabrics. In this way, the hermetic body keeps a stable flat surface. It features airtight, high tensile strength, high stiffness, can take high pressure, excellent stress distribution, durable and very good isolation function. Unbeatable Durability for More ApplicationsReduce vibration, silent, waterproof, moisture-proof, dirt-resistant, wear-resistance and skid-proof design make it versatile. No only for workout on the ground but also in the water. The pump can be use for inflating and deflating. -The valve maybe loose in the process of packaging or transportation. If it is loose, it will air leak, please tighten it tightly with a WRENCH in the package to prevent air leakage. -Please don't use it in case of strong wind, snow, fog, hail and other heavy weather in order to avoid accidents. -We are not recommend wear shoes to practice on the mat because the soles of the shoes usually have crushed stone, which is easy to wear out the product. -Please dont place it on stone or sharp object. -When the mat is pumped up. Please Turn off the air pump first, then disconnect the pump with the valve. If the pump working too long, it will overheating and auto off or the motor will be burned out. Restart the pump and try again if the motor is overheating cause auto off. If the motor was burn out, it cant work anymore. Industry Leading Design: Made of double thicken eco-friendly PVC tarpaulin underside prevents any unwanted sliding and ensures the air track have great bearing and will maintain its form. This material is easy to clean, simply wipe down with a damp cloth. Achievement of A Better Yourself: 3.94in space height tumbling mat features excellent resilience allow you to keep your balance for any exercise style. It is Non-slip, silent and zero air leak thanks to glued and sealed seams for a comfortable workouts and prevent injury. A versatile flat track ideal for recreational or starting gymnasts. Easy to Carry: With a carrying handle by side allows you for convenient transportation. The air mat can be fold and very easy to collect, just need to deflate it then roll it up and put it in the storage bag. Versatile Training Mat with Extensive Use: It isn't just for gymnasts it's also for fun! 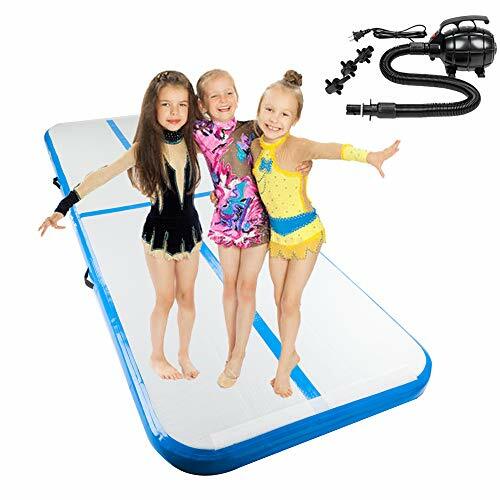 The air floor can be place not only indoor(Home/School/Fitness Clubs/Gymnasium) but also on the beach, park or even in water.